Australians are being encouraged to increase their recycling habits with a program called “Cash for Containers“. 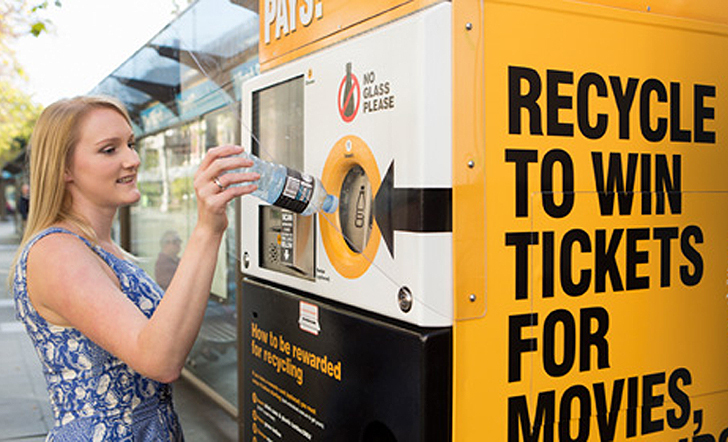 In Sydney (and hopefully areas across the country soon), kiosks are being installed that take in recyclable cans and plastic bottles and allow recyclers to choose their rewards, from cash to bus tickets. With beverage containers now outnumbering cigarette butts as far as litter is concerned, these reverse vending kiosks have the potential to help reduce public litter in a great way, and keep plastic from polluting the coastline and local waterways. Recycling bottles in Sydney, Australia.